It was very difficult to think of a title for this post. If I had named it only Sarmi, the Bulgarian readers would have guessed what it is about, if I had named it only Halupki, the Slovak audience would have know, so I decided to go the long way and include everything that would give you an idea what I am going to show you today. 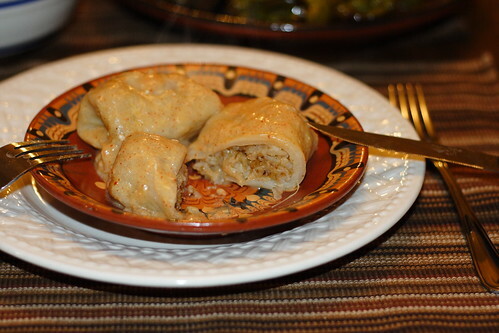 In general, Sarmi is a sauerkraut leaves stuffed with rice and ground meat. However, since my husband doesn't eat meat anymore, I decided to make a vegetarian version, so he can enjoy too. If you are a meat lover, you can very well subsitute the buckwheat with ground meat. The process of making is the same. 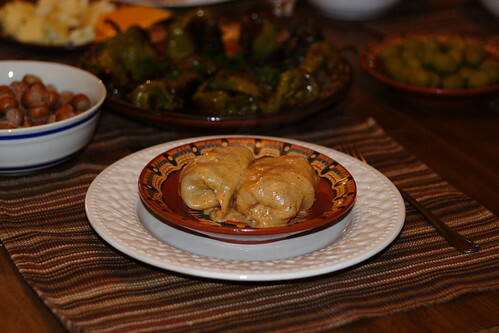 This is a dish that in my family at least was prepared around Christmas time and New years. I still remember the lunches we had on 1st of January at my grandmother's house, the traditional thing she made were these sarmi, although she used meat. Try it, you might find you like it! For those of you who don't know where to find sauerkraut heads, you can either make them yourself ( I am going to post a recipe about it too! ), or you can look for it Turkish, Serbian, Russian, Macedonian and sometimes even Asian stores. 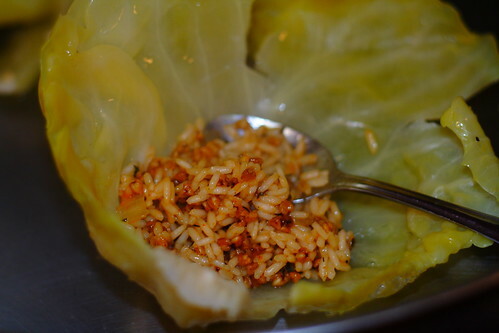 I realize it's not a common product you are going to use, so for all of you who would like to try the taste, but can't find leaves I have a recipe of Sauerkraut with sun-dried tomatoes and buckwheat recipe coming up! Look for it in the next couple of days! 1 1/2 quart the water from the sauerkraut ( if you don't have it, you can use regular water, just add a little bit of salt to it, it wouldn't be the same, but close enough. 1. 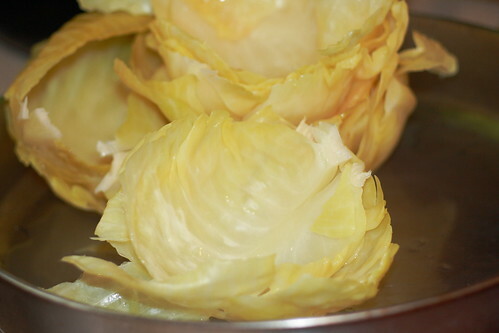 From the 2 large cabbage heads remove the largest leaves, set them aside. 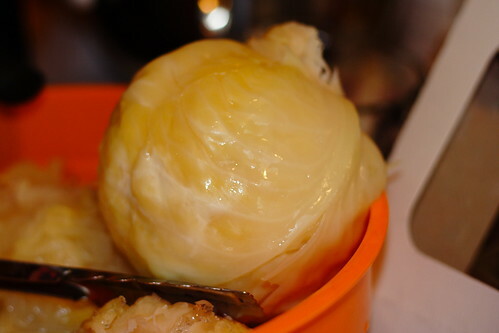 This is how the cabbage looks when it is prepared as a sauerkraut, it has to have yellow transparent in places color! 2. 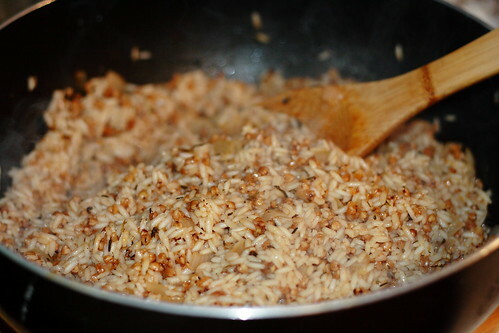 In a large non-stick pan fru the onion, white rice and buckwheat together. Add the black pepper, salt and paprika. * Note: if you want to make it more spicy, you can add chayene pepper instead of paprika, or if you want more "eastern" taste, you can add some curry to it. *Note 2: This recipe is very basic, if you like to take the experiment a little further, you can try adding ground meat, bacon, chopped mushrooms, walnuts, olives, even raisins to it. I didn't want to overwhelm my kids with the taste, that's why I prepared it that way, but I can assure you that I have prepared it with each of the things I listed( well not all of them at the same time) and I confirm it is delicious! 3. Add half of the sauerkraut water and let it simmer until all the water is absorbed.In the pan you are going to cook the sarmi in place sauerkraut leaves to cover the bottom. 4. 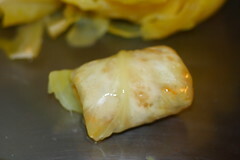 Place each cabage leaf with the base towards you, spread a tablespoonful of the rice on it and then fold like a blanket.Place the ready sarmi in the pan and have in mind that they have to be very close to each other, to hold their shape. Then add a second row, and a third row if there is a s space. *Note: It would be best if you have a pressure cooker for this recipe, but if you don't allow yourself at least 2 hours for simmering. 5. Place a large plate on top or the last row ( you are going to use it as a "weight" to hold the sarmi down, use an old and heavy plate, and be careful when you take it out later, it might break!) and add the rest of the sauwerkraut water.Place the lid on and let it simmer on Medium Low on your stove for at lest 2 hours. *Note: If you see that it's still not ready but it doesn't have more water left, you can add water as many times as you think nececary. Just don't do it on top of the hot plate, because it might break. 6. 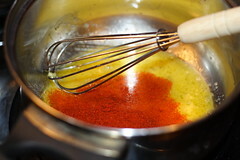 In a small pan mix the egg, paprika, yogurt and flour. 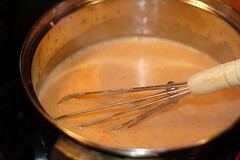 Place it on the stove and stirr constantly over medium high. 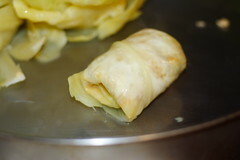 After a minute and a half ( the egg has to look cooked, but the mixture should be liquid) spread the sauce over the sarmi. Serve hot with a red wine and a lot of black pepper! 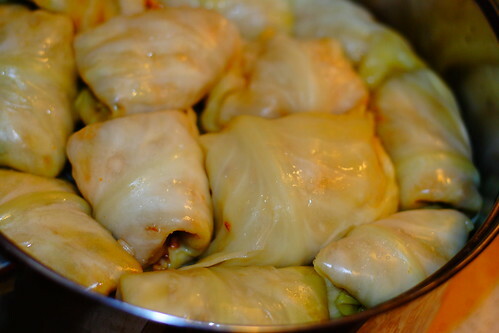 Recipe in Bulgarian / Ако искате да прочетете рецептата на български, кликнете тук. Рецептата на българси е с месо, но както писах и по-горе, можете спокойно да замените месото с елда, така ще направите сармите вегетариански. Процесът на приготвяне е същия. Cool this looks really good. 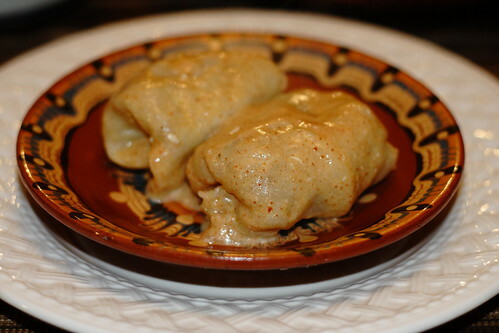 It kind of reminds me of Galumpkis, which my Dad makes quite often because we are Polish. I bet that if you tried to make them they would be pretty good too! Hi, I am glad you like them! I think Galumpkis is the same thing as Sarmi( at least Wikipedia says so ), but you have to add meat. 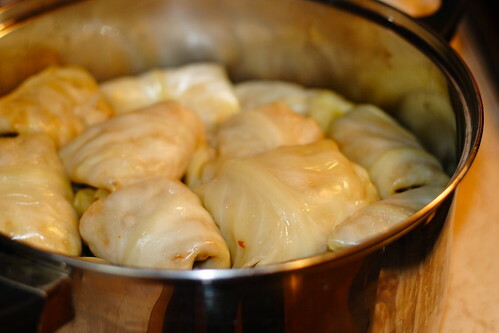 :-) Originally the Sarmi are with meat too, but this time I decided to make them without. Try it, you might like it! :-) I would love to see pictures of yours too!